If you’ve been following along on Inspirational Beading over the past several months, you know that there’s nothing I enjoy more than a good challenge. 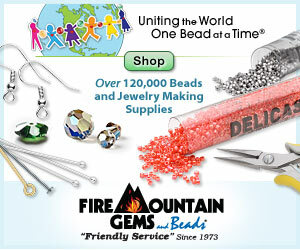 Whether it’s entering a single piece into a competition, or creating a set of personal beading goals, I’m up for it. Not only are beading challenges great for creativity, but they can make for excellent blogging as well. 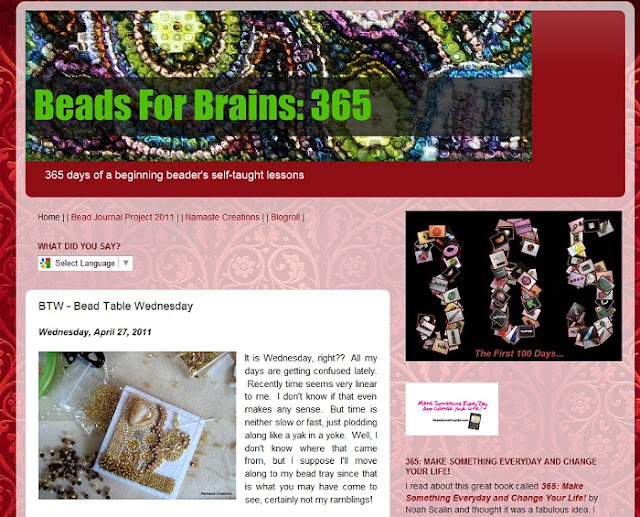 Enter Beads for Brains: 365, a beading challenge inspired by Noah Scalin, the mastermind behind the Skull a Day project, and author of 365: Make Something Every Day and Change Your Life! I thought that making a project every day for a month, or once a week for a year, was a great challenge. Imagine beading every day and sharing your experiences, trials and triumphs with readers in a countdown blog for one full year! The blogger and bead champ, Mandy, is determined to master the art of beading through this challenge, and is using a variety of on and offline resources to tackle new techniques like tubular square stitch, and projects like Sue Jackson’s Fleur du jour, and the Bead Journal Project. What I love about Beads for Brains: 365, is that readers of any skill level can learn along with Mandy, discovering new techniques to try, and finding unique insights into bead and stitch styles from a trial-and-error point of view. If you’re just getting started with beadwork, or you just want to follow along as one beader blossoms, this blog is worth a visit! What have you been reading? If you’ve got a favorite must-read creative blog, share a link in the comments! Blog Spotlight is a special tribute to my wonderful readers. Featured blogs are chosen from the previous months comments. Thank you so much for reading Inspirational Beading! You are so sweet to add me to that list! I have clicked on the link to Mandy's blog and after I am done catching up with you I am going over there.